Because the Skylanders and Disney Infinity figures weren't enough, the toy population of my desk has been increased by a dozen Nintendo icons. Let's meet the Amiibo! Nintendo's Amiibo figures utilize the Wii U's built-in near field communication feature to interact with games like Mario Kart 8, Hyrule Warriors and the eagerly-anticipated Super Smash Bros. Wii U. Nintendo experimented with the functionality in Pokémon Rumble U, and now they're ready to go wide with it. Well, almost ready. The Amiibo functionality will be arriving with a system update before the figures are released alongside Super Smash Bros. Wii U later this month, so until then all I can do is take pretty pictures of them. Here's the set I was sent, prior to being vigorously torn open. The packaging reminds me of some of the old imported Street Fighter figures I used to get with extra credit at GameStop. Note Kirby's positioning in his package. Kirby cannot be contained by conventional packaging. Note that each of the figures is packaged with a square of material beneath it which likely functions to keep it from being read inside the package. If that's the case, we won't have to worry about fully leveled-up Smash Bros. Amiibo being sold in sealed packages on eBay. Here we see an average-sized Skylander, an average-sized Disney Infinity figure and an average-sized Amiibo. This size comparison demonstrates how confusing my desk is right now. 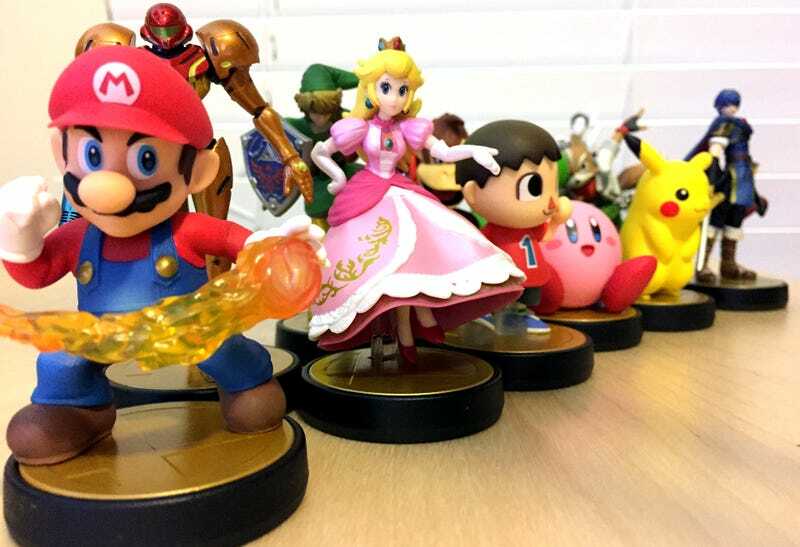 Mario is the logical starting point for any evalution of Amiibo figures. He's the most recognizable after all, and therefore he's Mr. Most Likely To Appear In Marketing Materials. He's also an excellent example of the level of detail in these figures. Check out the top picture. Noticed the light yellow-ish paint around his tummy tum-tum? The designers used this paint application to simulate the light coming from his fireball. I don't think I've seen paint used in such a way before. Other toy makers would just pop the transparent plastic in his hand and be done with it. Quite impressive. Link's pose bother's me. It's not the horrible yellow cylinder that doesn't even go all the way up. It's that he's facing downwards slightly, so you can't see his eyes without tilting the figure upwards. And when you do tilt him up to capture a shot of his face, he turns all blurry. I certainly didn't take a bad photo, so that's the only explanation. Donkey Kong is almost perfect; I really love this figure. The sculpted hair detail is excellent, and the DK logo on his tie is spot-on. The only reason he gets an almost-perfect is the stupid little stand they gave him. It looks like he's sitting on a futuristic Japanese toilet. Coupled with his dynamic pose it's easy to imagine Donkey Kong is taking the most enthusiastic DK dump ever. The Villager from Animal Crossing maintains the same dark menace of his virtual counterpart. I can't help but wonder why they felt the need to encase his sneaker in clear plastic. Seems like a pretty flat connection point to me. Fox, on the other paw, needs all the help standing upright he can get. His super-detailed boots are held in place by dark blue translucent plastic. Why dark blue, when other figures have clear or yellow or pearly-white supports? I don't know, man. I just don't know. The Wii Fit Trainer is a pretty easy figure to make, what with not having to worry about shading anything. Still, good job getting that tiny logo on her workout top. I also admire her dedication to fitness, maintaining her routine despite having half of one leg in a cast. One of my favorite Nintendo characters is one of my least-favorite Amiibo figures. Not because Yoshi's paint is a little rough, but because of that noticeable seam in his big, bulbous nose. You can see it a little better from this angle. Between the seam and the way the nose connects to the rest of his body, it feels as if it should be removable. Maybe a place to store little green polka-dotted eggs or something. It is not. I hope Marth senpai notices me, but I can't tell with those freaky emo eyes. Otherwise a nicely-detailed figure, Marth loses something around the face. The paint application just doesn't look like him. I'll pretend he's a cosplayer. At least his sword is straighter than it was in our previous look at the figure. Easily my favorite figure of the bunch, even if I say it about a different figure earlier or later in this article. The lines of the suit are perfect. The pose is majestic. Despite having relatively small contact points with the base, the manufacturers didn't feel the need to lock her feet in place with extra plastic. Just a little extra under the high heels, effectively making them flats. Everybody wins! Oh Pikachu, you're so simple and elegant. You just sit there attentively, ready to accept my commands. Whose a good pocket monster? That's right, you are! I bet the folks in production love Kirby. After spending all that time trying to paint Marth's face and Metroid's armor (the production folk in my head think Samus' name is Metroid), here's a pink ball with read shoes and a stamped-on face. I bet they fought over who got to handle Kirby every day. I bet someone was stabbed over it, and Kirby just watched. My most anticipated figure, I worried that the good Princess may have strayed too far from her early model. Having seen her up close, the differences aren't all that bad. The inlaid pattern on the skirt is gone, replaced with paint, and some of the raised details of the underskirt are lost, but still — they made an underskirt. They tried, and the effort is appreciated. Even if the random pink specks on the trim aren't. I'll have to grab some white paint and fix those up. And that's the initial set of Nintendo Amiibo figures. They're a lovely addition to my desk, and soon they'll be a lovely addition to several excellent Wii U titles. I'll show you how that works when the time comes.